I’m Andy, and as the name above the door implies, I do the arty stuff. After graduating with an art degree in 1996 I cut my teeth in the London creative scene shooting lots of book jackets, album artwork, magazine covers and advertising campaigns for brands like Toblerone, Cobra beer, ITV and Channel 4. Far more important to me is that I’m now a dad to 2 gorgeous children who I adore. Frankly I’d quite happily spend my days documenting their childhood but they do seem to get mildly annoyed by dad constantly poking his camera in their faces… so I decided to spend my time photographing other peoples children for a living… and love it! Over time I’ve developed a highly unique style and personal approach to portraiture. I love capturing natural purity, raw emotion and real character. Debbie, my very best friend for over 26 and gorgeous wife for 15 years, specialises in making our families feel comfortable and relaxed. She also has the very important job of caring for our VIP visitors… the newborns… a role that she adores! Our Cosy StudioLocated in a self-contained detached building next to our family home, our boutique (small but perfectly formed) photography studio has been perfectly designed from the ground up to cater for children and their families. We have all the facilities that you’d expect from a high street studio with the added bonus of a lovely friendly and relaxed feel, perfect for helping children (and parents) feel at ease. The studio has a main shooting area with top of the range lighting equipment placed on boom arms. This prevents small children from toppling over precarious stands and potentially hurting themselves, although it also means that we’re constantly cracking our own heads! We have a comfortable sitting area that doubles as our viewing room with loads of artwork samples, as much tea, coffee and chilled water as you can drink. The biscuit tin is normally full, unless the kids are on holiday then we might be able to muster up a rich tea, if you’re lucky! 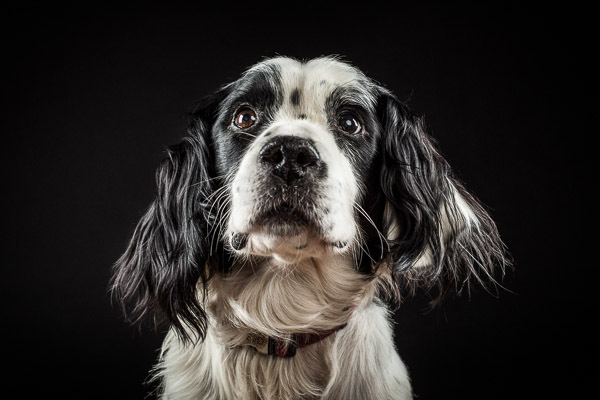 The final member of our team is Bram, our 11 year old springer spaniel. Even though he isn’t allowed in the studio (he just smells too bad) he’s very much loved and can come in very handy when bribing younger children with a quick fuss after the shoot, although this isn’t compulsory!